On June 2, 2010, without any fanfare or drama, one of baseball’s best players called it quits… Ken Griffey Jr., aka, “The Kid”, as he was affectionately called in his earlier years, decided that he was no longer a kid. At the age of 40, he hung up his cleats, possibly feeling that he was incapable of performing to the highest of standards that he had set for himself. But it doesn’t mean that it was the end of the road for him. It was simply a transition in his life. He went on to enjoy his family, watching his kids excel in their sports and activities, coaching his son’s football team, doing some photography on the side, and enjoying the fruit of his labor. Nothing wrong with that. He embraced his season of transition. Life is filled with transitions. Some good. Some bad. Some necessary. Others avoidable. Some joyful. Many painful. Simply put, transition happens. But it is a normal, and might I add, ‘healthy’ part of life. Karine and I recently experienced another one of these “divine interruption” moments, resulting in yet another TRANSITION for our family. This past June, we left a church that we had been pastoring in South Carolina for the last four years, literally piling all of our earthly belongings into a 26′ U-Haul, saying goodbye to friends, and heading 600 miles south back to Florida, where God had originally placed a dream in our hearts nearly 18 years ago. It all began with a whisper; at an unexpected moment; and we are now pursuing God’s big, audacious, scary-yet-thrilling dream for our life! What is this dream? It’s the dream of PLANTING A LIFE GIVING MISSIONAL CHURCH on Florida’s Gulf Coast where unbelievers will not only be welcomed, but expected! 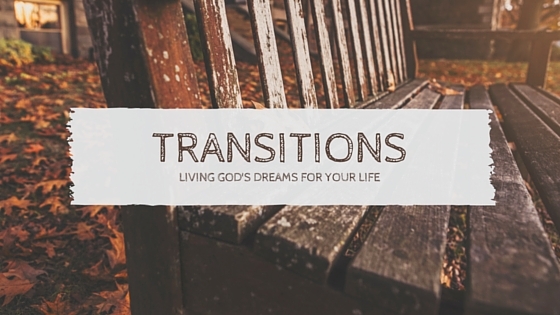 After wrestling with the implications of this dream, we took an incredible leap of faith when I tendered my resignation at the church, not knowing where we would land, but being confident that God would be there waiting for us. This transition has not come without a certain level of fear, however. Yes, I know, I know, as believers “we have not been given a spirit of fear.” But, can I be brutally honest and completely transparent for a moment? Leaving a comfortable job, with a dependable income, with no guarantee of gainful employment awaiting us in Florida, and having the responsibility of a wife and four children added into the mix–there’s plenty of opportunity for fear! There’s always opportunity for fear, isn’t there? Thankfully, we serve a God who understands our weaknesses, who cares about our concerns… and provides all of our needs… and not only that, but also walks with us through our fears. Which reminds me of Joshua. Did you see that? Read it again. What stood out to me in this verse is the inferred reality that Joshua was facing–FEAR and DISCOURAGEMENT. Have you ever been there? If so, you’re in great company! Think about it, God actually commanded Joshua to be strong, courageous and to not be fearful or discouraged in his new faith journey. Why? Perhaps because He knew Joshua and his limitations like no other and saw the redemptive potential in him that Joshua may not have seen himself. This gives me great encouragement for the journey that lies ahead for me and my family, because just like Joshua (as followers of Jehovah), we are all imperfect human beings struggling to follow God’s perfect leading in this dangerous journey called life. As I was with Moses, so I will be with you; I will never leave you nor forsake you (Italics mine). So, whatever transition you may be facing today, let God be your strength and your courage. I know I will! Now, let’s go plant a church! P.S. I will be updating our church planting journey more frequently in the near future as we begin the year-long process of getting things in order for Launch Day! So please check back often. Blessings!